Cano vs. Madiev is a 10-round super lightweight fight presented by Golden Boy Promotions in association with 360 Promotions. The event is sponsored by Tecate, "THE OFFICIAL BEER OF BOXING" and Hennessy, "Never Stop, Never Settle." The fights will take place on Thursday, Sept. 13, 2018 at The Joint at the Hard Rock Hotel & Casino, Las Vegas. 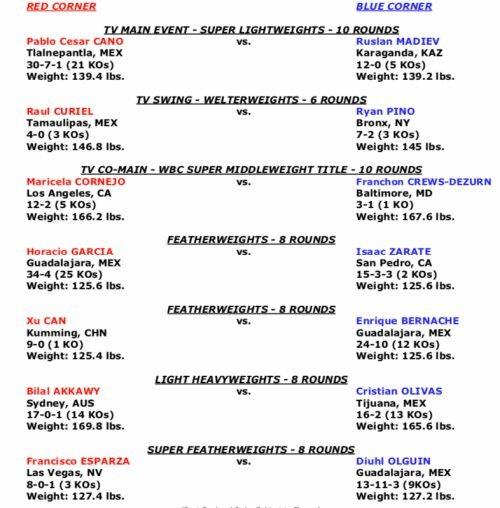 ESPN2 and ESPN Deportes will air the fights beginning at 8:00 p.m. ET/5:00 p.m. PT. ESPN3 will live stream the fights beginning at 6:30 p.m. ET/3:30 p.m PT. Tickets for Cano vs. Madiev are priced at $75, $50, $25, and $10, not including applicable service charges and taxes. Tickets go on sale Monday, Aug. 20 at 10:00 a.m. PST. To charge by phone with a major credit card, call Ticketmaster at (800) 745-3000 or The Joint Box Office at (702) 693-5000. Tickets will also be available for purchase at www.goldenboytickets.com and www.ticketmaster.com. Special Offer: VIP Seating for the Canelo vs. GGG 2 weigh-in: Purchase a ticket Cano vs. Madiev and receive VIP seating to the Canelo vs. GGG 2 weigh-in at T-Mobile Arena on Friday, Sept 14. The Cano vs. Mediev ticket stub must be presented at the Canelo vs. GGG 2 weigh-in for VIP seating.